You must be surprised to see a dietary supplement review on my blog today! Well, just so you know, I still do not take any of these dietary supplements because I have allergic reactions to certain food, so just to make sure, I usually say NO to product review that I need to ingest! Unless they are vitamins that I really take. But, this product is an exception to the rule! 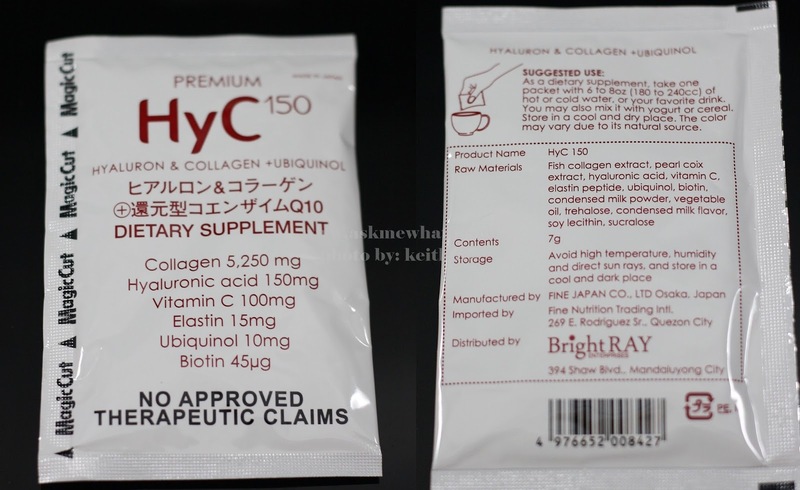 This is Premium hYC150 --- a Collagen Drink and just so you know, my mom-in-law really take them daily so she must be the right person to do a review on so called Japan's Best-Kept Longevity Secret. I know how effective it is to "drink" the nutrients you need, that's why I got really excited and shared this to my mom-in-law right away and she actually consumed this the day I handed this box to her. Now what's Premium HyC150? Based on a bit of research, this product is developed by FINE Japan Co. Ltd, this is finally available in the Philippines. Premium HyC150 is said to be the only supplement drink that has the optimal combination of active anti-aging ingredients such as Hyaluronic Acid, Collagen and Ubiquinol. Collagen, has been going around the "beauty world" because it is a natural protein present in our skin dermal layer. This lays a healthy foundation for our skin and help strengthen the bones and maintains the flexibility of the skin. Hyaluronic Acid, on the other hand, acts as space filler by binding to water and keeps the skin wrinkle-free. It also helps lubricates joints, ligaments and connective tissues. The best part of having Hyaluronic Acid as part of your system? It also hydrates surrounding tissue and keeps the collagen nourished and healthy. You may see it via lustrous hair, moisturized scalp, well-hydrated and plump lips and healthy gums. Now this last ingredient I honestly do not know, Ubiquinol, is actually a natural antioxidant to provide physical and mental energy the rest of the day! Combining other potent ingredients, the product makes joints stronger and flexible, nourishes the scalp and hydrates the eyes for clearer vision. It also improves muscular strength and heightens mental alertness. All information above are from Premium HyC150 press kit. Now let's talk AMW language shall we? Is including this to your daily regimen beneficial for you? My mom-in-law started taking a sachet of this per day since January 31, 2015. We took a shot of her "before" photo on that same day! On February 10, 2015, we took another shot of her using same settings of the camera and I'll show you side by side comparison after 10 days/10 sachets on the latter part of this post. Mommy AMW drinks HyC150 daily during night time. She mixes the Premium HyC150 with her favorite Cranberry Juice. Mommy AMW's lifestyle is quite active, she does household chores, help me look after Toddler AMW at times I need to work, she runs around doing tasks for business and home. Mommy AMW uses regular skincare regimen day and night. She didn't change any of these as she started taking Premium HyC150. One sachet is good for one cup of Cranberry Juice. The powder "thickens" into a yoghurt-like texture. So far, she can't seem to see a dramatic result on drinking Premium HyC150 in just 10 days, she did noticed how less drying her skin though. She usually complains about muscle pain but drinking Premium HyC150 made her complain less about these body aches. She felt she has more energy. Overall, she told me she needs to go beyond 14 days to really see the result, I agree with her! And yes, she will continue to take HyC150 dietary supplement because she felt really good! I will definitely share more insights after her 14th day! So yes, you'll see another post on HyC150 Hyaluron, Collagen and Ubiquinol drink because the good friends from the brand will be giving away boxes for AMW readers to try! *yay*! Each box contains 14 sachet (good for 14 days) priced at Php1,700.00 per box. So far, there aren't any drastic changes seen on before and after photos. 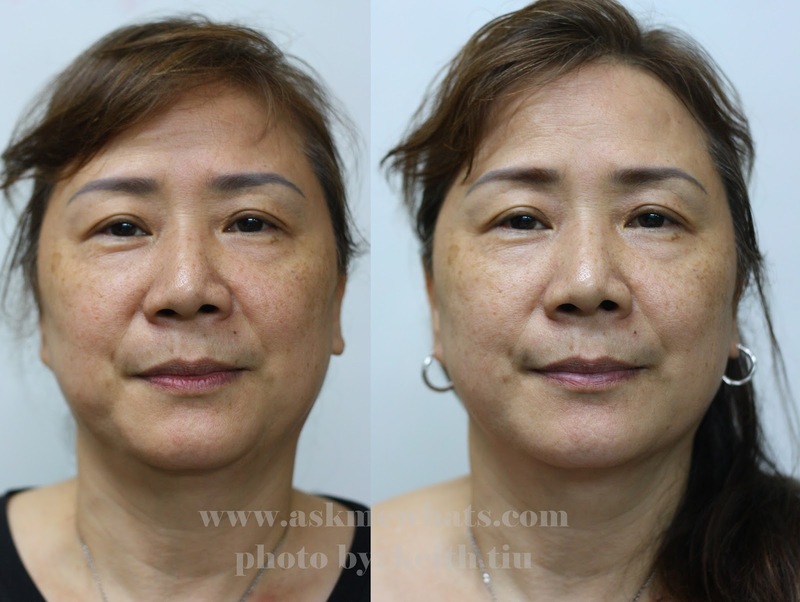 The dark spots on her face still remains BUT, what I realized after looking at the before and after photo on how the redness of her skin lessened! (photo taken in same setting, same time, NO FLASH). She told me she will definitely continue the drink as she feels good taking this daily! Thanks momma for helping me and my readers out! Are you into dietary drinks? Do you drink Collagen drinks as part of your "beauty regimen"? Are you excited to win 2 boxes to try for a month? Please share your excitement to me! Your mom looks more youthful sa 2nd pic! :) how's the taste? Yeah, I realized I didn't really explained the taste, kasi my mom in law can't figure it out daw, tapos last night she went..ALMOND!!! lol had a bit of almond-y taste! and now, much better pa her skin! I'll post about her 3rd pic when I get the chance! super hiyang siya! Hi i wanted to know how your mom look today coz im also taking it now. It was recommended to me in the drugstore. Last night was my first. So im very curious how it went with your mom in law. Is there any side effects or any condition we need ti vr aware of? Is this from natural sources? Is there any update? Did she continue and if she did what was the result? Two weeks is too soon to evaluate the efficacy of any supplement. Really, you need at least 8 weeks to compare the difference, particularly with skin. That being said, the difference in her jawline/lower face in just two short weeks is HUGE. In the 2nd, the contours are smoother and more filled in, the jowls are gone, and her jawline has become rounder and defined!